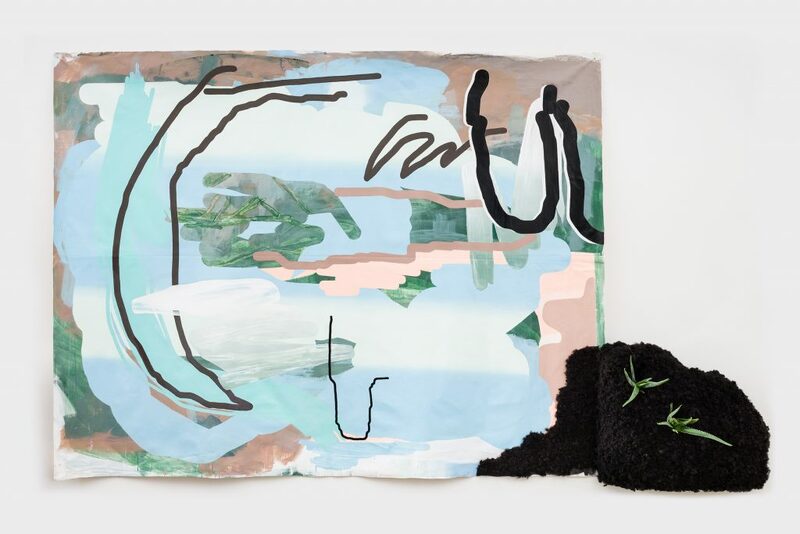 Deborah Anzinger, An Unlikely Birth, 2018, Acrylic, mirror, and synthetic hair on canvas and polystyrene 80 x 131 inches. Courtesy of the artist. The Institute of Contemporary Art at the University of Pennsylvania welcomes you to celebrate the opening of our Spring 2019 exhibition season, comprised of the exhibitions Introducing Tony Conrad: A Retrospective, Deborah Anzinger: An Unlikely Birth, Colored People Time: Quotidian Pasts, and Open Video Call. The first US solo museum exhibition of the Jamaican artist, Deborah Anzinger: An Unlikely Birth brings together sculpture, video, painting, and installation, combining both synthetic and living materials, to consider geographical, ecological, and spatial paradigms. The exhibition reveals how the artist disrupts existing relationships and hierarchies as they pertain to the politics of land, the body, and space. An Unlikely Birth is curated by ICA Whitney-Lauder Curatorial Fellow Daniella Rose King and will be on view through August 11, 2019. Working at the intersection of black feminist thought, geography, and space while coalescing concerns Anzinger has long held, An Unlikely Birth explores a plethora of issues urgently facing our civilization—the environment, the economy, and human rights–and their aggressors, capitalism and globalization. Through the work on view, Anzinger offers intimate networks and alternative ways of being in the world as possible answers to these intersecting problems. Thinking through reproductive labor, the transference of energy, and sanctuary, the artist compounds these fields with the testimony of individuals from Jamaica as a means of re-centering marginalized voices. Quotidian Pasts, the second chapter in the three-part exhibition series Colored People Time, reconsiders the trafficking of blackness through the colonial practices of collecting, commodifying, and exhibiting people and objects from the African continent. This exhibition, produced in collaboration with the University of Pennsylvania Museum of Archaeology and Anthropology, turns its lens toward early-twentieth-century anthropological displays. The long history of the exploitation of both African people and their cultures is told through the configuration of a few small objects—a photograph, a journal entry, a letter. Featuring a newly commissioned work by the artist Matthew Angelo Harrison, Quotidian Pasts questions: What confers authenticity? How does an object change when dislocated from its time and place within the context of the museum? MEMBERS PREVIEW 5PM: Preview with artists and curators (ICA members only). OPENING CELEBRATION 6:30PM: Free for all to attend; complimentary snacks & cash bar.